These old original Epi's are under-appreciated and under-valued, IMO. Perhaps because the woods are laminated. But for this much vintage mojo and character... Heck, the case alone might be worth hald this price to the right buyer. OHSC Very nice 3-piece cherry/maple neck w/ block inlays and ’New York’ PU started in 1949; would have a Frequensator tailpiece starting in 1950; (serial dates it from 1945 ’1950); 17 3/8’ wide; maple back and sides and lam. spruce top (rare, as most had maple tops that I've seen); nice acoustic sound; appears to have original tuners, knobs (on MasterVoicer plates), tailpiece, PU and bridge; great flame on neck! ; Note that there is no access panel on this guitar; 3-ply top binding; bound RW fingerboard with nice slotted inlays and very nice frets; OHSC has embossed ’E’ inside like others I’ve seen; it is in decent condition with all latches and nice inside. This guitar has a good acoustic sound. The sides and neck are birds-eye maple, the binding matches all around, and is in great shape. Given the lack of access panel: I am not sure when EPI stopped doing this. 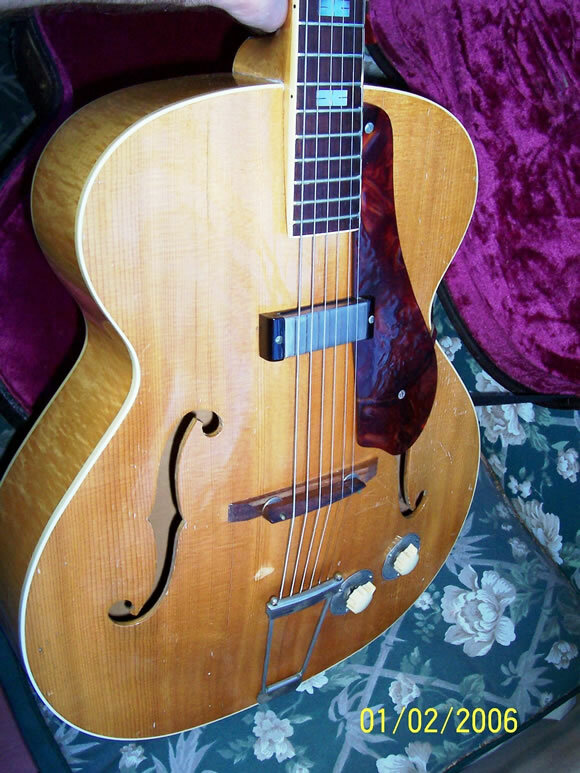 If this guitar was re-backed (possible, but a long time ago) the finish on back is old and matches color. There is only one spot of missing finish on top, from finger wear. Another nice feature is the headstock veneer’there is a 3-play veneer here (maple, a light brown, and then a dark brown wood. Nice touch). Guitar is is in quite nice shape overall.